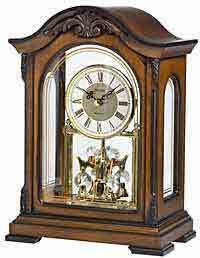 The Howard Miller 635-183 Camlon Chiming Mantel Clock features a weathered, Driftwood finish inspired by the natural yet rustic nature of reclaimed woods on select hardwoods and veneers. The soft black dial with polished chrome-finished Arabic numerals, hour and minute hands, and bezel is encased beneath flat glass. Quartz, triple chime Harmonic movement plays your choice of full Westminster or Ave Maria chimes with strike on the hour with 1/4, 1/2, and 3/4 chimes accordingly; Westminster chime and strike on the hour only; or Bim Bam chime on the hour only. Requires two C sized batteries. 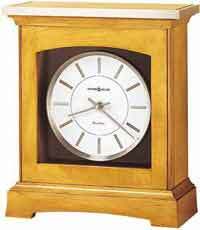 Size: Height 11" Width 9.25" Depth 4.25"
Clocks for sale at The Clock Depot including the 635-183 at discount prices.